Monitor. Automate. Manage your business in real-time. ThingTech Real Time is the revolutionary real-time cloud-based solution designed for asset intensive organizations. Monitor routes, mileage, and time spent on each work order to identify where you can improve. Get alerts when workers are speeding, idling, off-schedule, and enter or exit a job site. ThingX Connectors allow you to easily connect to your back-end CRM and ERP solutions to integrate customer, financial, and other mission critical data into your real time solution. ThingTech Real Time helps you monitor and manage assets in real-time by pinpointing the exact time and location of an asset’s condition, health, utilization and movement. Map all your assets, equipment, sensors, field workers, and jobs on one screen. ThingTech Real Time is targeted at organizations that own or operate vehicles, heavy equipment and machines, sensors, mobile assets, and a mobile workforce that require real time asset location, status, diagnostics, utilization, productivity and alerts. Easily define “things” (e.g. vehicles, assets, sensors, equipment, mobile phones), connect to them using multiple wireless communication methods, define automation rules for your things, and generate actionable data in messages, events, alarms, and workflows. Users can create custom ThingX layers for mapping, graphing, time playback, and analytics. Real time asset data is instantly processed into actions to improve operations, reduce costs, and increase customer satisfaction. ThingTech Real Time is built on ThingTech’s end-to-end IoT platform and uses an extensible object model to extend the properties of your IoT devices into a cloud database. IoT device data is gathered in real-time, transported securely across your network communication protocol into our serverless cloud that performs data analytics, and contextualized via desktop and mobile. ThingTech Real Time includes ThingX Mobile, a stunning and intuitive mobile application that enables supervisors and field workers to access job-critical data in real-time. ThingX Mobile is available on Google Play and the App Store. When we switched to ThingTech from our old GPS tracking solution, access to the data is much better than what we had before. Plus, we were immediately alerted when a theft occurred and we were able to recover $300,000 of property using ThingTech. Our scalable, future-proof solution will allow you to gradually or quickly add devices as your business evolves. Scalability also means that your IoT solution will maintain performance levels as it grows, while avoiding the need for major improvements or changes to your IT infrastructure. Also, you can easily deploy devices at different times by various hardware manufactures without disrupting how data is gathered, stored, analyzed and reported. The value of data comes from having it, how you use it, and the context by which it is analyzed. Real-time data gives you the ability to improve the quality of business decision making with speed and accuracy. It becomes actionable when used to properly maintain assets, verify sales and service delivery, or streamline job scheduling and dispatch so that field workers can accomplish more with less. Get real-time visibility into the location, condition, and performance of your “things” (e.g. vehicles, assets, sensors, equipment, facilities, infrastructure). Connect your things using wireless communication protocols, define automation rules, and generate actionable data through messages, events, alarms, and workflows. Visualization of data, patterns, and trends are critical. ThingX Mobile provides rich, beautiful mapping and navigation capabilities with and easy-to-use, stunning mobile application user interface. 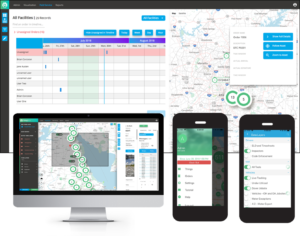 With ThingX Mobile, you can track your fleet, equipment, and mobile workforce in real-time. Map all your assets, field workers, and jobs on one screen. Plus, get alerts when field workers are speeding, idling, off-schedule, and enter or exit a job site. Improve operational efficiencies by using IoT-enabled devices and sensors to remotely monitor the status and condition of your assets. Our flexible rules-based engine will allow you to process streaming data, trigger alerts, create workflows, and generate actionable data. You can configure rules, meters, and frequency in a way that aligns with the best business outcomes. Also, automate events-driven decision making based on rules logic. Pressure to control costs is driving companies to become more efficient by improving internal process. Asset performance has a direct effect on top and bottom line growth, which means you need an efficient way to keep up with the maintenance of all assets, inspections, parts and inventory. Overcoming this challenge with spreadsheets or information stored in various databases is tough. Maintenance organizations can use real-time data to alleviate the burden of asset management by improving the performance, lifecycle, and utilization of assets. Combining GPS tracking, vehicle diagnostics, and Driver ID data with Salesforce CRM to get a complete fleet management solution. Know where your vehicles and workers are in relation to where they should be in real-time. Set alerts for speeding, idling, diagnostic trouble codes, or unauthorized usage. Build driver scorecards to rank and evaluate driver performances. Know exactly where your field workers are, where they’re going, and what resources and information they have access to. Gain visibility into routes, arrival and departure verification. Send work orders with location, job type, and other descriptive data. Easily view and edit asset records directly from mobile app. Attach files, pictures or videos to a work order. Costly truck rolls, repeat visits, and customer dissatisfaction can cause headaches for any fleet, asset, or field service manager. With ThingTech Real Time, you can gather streaming data and then access it in a way that’s most meaningful to your company. Compile reports into dashboards to visually display KPIs and usage trends. Analyze your location-based data, expected work flows, assets in use, and asset conditions to plan for preventative maintenance or replacement. GPS mapping and navigation allows you to track assets and mobile workers in real-time. Get a 360° view of assets and workers in proximity to your real-time location. Increase operational efficiency by reducing wasteful idling, optimizing routes and schedules, improving driver behavior, or preventing costly breakdowns and unplanned downtime. Get pre-configured, real-time out of-box reports and dashboards to identify which metrics (or combination of metrics) move the organization forward towards its goals, and potentially predict future events. Access unlimited data layers in map or list view. Map geofences and customer locations to keep jobs on schedule. Easily add IoT-enabled products to your existing deployments. Automate PM schedules using streaming real-time data gathered from telematics, sensors, and DTC codes. Enhance mapping and navigation, route planning, work order optimization, job scheduling, and dispatching. Quickly install and easily associate driver information to the vehicle he or she is operating to monitor driving behaviors. Connect all the vehicles, assets, machines, and infrastructure you own or operate in one place. Connect to back-end CRM and ERP systems to integrate customer, financial, and other mission critical data. Discover the relationship between data inputs and operational outcomes. Predict failures before they occur.